Ellisia nyctelea (L. ) L.
Stems: Erect or decumbent, simple or usually branched, angled, bristly-hairy. Leaves: Alternate above, opposite basally; deeply pinnately-divided, .8 to 3.4 inches long, .4 to 2.4 inches wide, sparsely bristly-hairy; divisions 5-13, lanceolate to linear-oblong, margins entire or few-toothed. Inflorescences: Solitary, on short stalks in or opposite leaf axils. Flowers: Small, inconspicuous; stalks mostly under 1/2 inch long; calyx 5-lobed; sepals lanceolate to triangular, united near base, tips pointed; corolla bell-shaped, 5-lobed, white to bluish or lavender, shorter than or equal to calyx; stamens 5, equal. Fruits: Capsule, drooping, more or less spherical, 1/5 to 1/4 inch in diameter, coarse-hairy, subtended by persistent calyx; seeds usually 4, spherical, 1/10 inch, dark brown to black, finely network-veined. Habitat: Stream banks, waste ground, open woods, thickets, open prairie sites, moist disturbed areas; sandy soils. 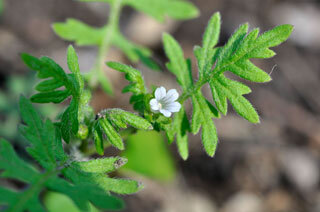 Uses: The seeds are eaten by small animals and ground-foraging birds. Comments: Named in honor of John Ellis, 1711-1776, an Irish-born merchant and naturalist who discovered that coral was formed by animals.